My friend Nicky and her family have embarked on their Next Big Adventure. This time it's Perth, Australia. Which seems more permanent than say a couple of years somewhere in the UAE, or a stint in the UK. But we don't use the word emigrate. That word has the ability to break hearts. So instead it's the Next Big Adventure. The day before they left for their NBA, I took the boys some Peppermint Crisp chocolates, because they are my favourite. (Although I also love Cote d'or Bouchees or olifantjies -little elephants - as we called them when I was little and we dipped into my mother's private stash. And I wouldn't say no to anything with the name Lindt on it either.) Everyone had an opinion on how to eat Peppermint Crisps. I believe one must do so quickly. Others feel the need to nibble off the pure chocolate bits on either end and then dip the one end of the chocolate into a glass of milk and drink the milk through the tiny peppermint straws inside the chocolate. This way the milk is peppermint flavoured and then you eat the leftover chocolate afterwards. I am not sold on that idea. And I have yet to try this method, but honestly I think it's a waste of a good chocolate. I will however sacrifice a few Peppermint Crisps in order to make that South African speciality Peppermint Crisp tart - the one with the Orley Whip and the caramel made from condensed milk. Many years ago, I bought a Peppermint crisp that had no peppermint straws in it, it was just a lovely slab of minty chocolate. Surprisingly I was not disappointed, in fact, I recall being rather happy about it, and hoped that I would be so lucky as to get a faulty chocolate again. But I never did. And that's ok, because Peppermint Crisps, even the older chewy ones, never disappoint. Which is why I wanted to give them to the boys, I wanted to give them something that I had liked as a child, something that was South African. 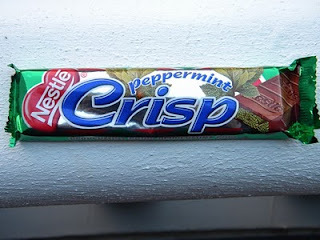 But then I heard that Peppermint Crisps are found in one other place in the world, Yup, that's right, you can find Peppermint Crisps in Australia. Which made my gift-giving even better, I could tell the boys that whenever they longed for home, they should ask their mom to buy them a couple of Peppermint Crisps, because we still believe them to be as South African as boerewors and biltong. And yes, while the Ausies may have sausage and jerky as well, we KNOW it's a poor second to our variety. The same goes for chocolate, it's ok in a pinch; if you can't pop round to the corner cafe and ask for it in your mother tongue, and it will remind you of home. And chocolate does lessen the pain of homesickness a little bit. Which brings me to the second part of this blog. Joanne Fedler's book When Hungry, Eat. I saw it last weekend, having realised that my clothes no longer fit and that I had been misinterpreting the concept of a No Diet lifestyle. I have been taking it to mean eat everything, as much and as often as I like. Which clearly is not a great idea. 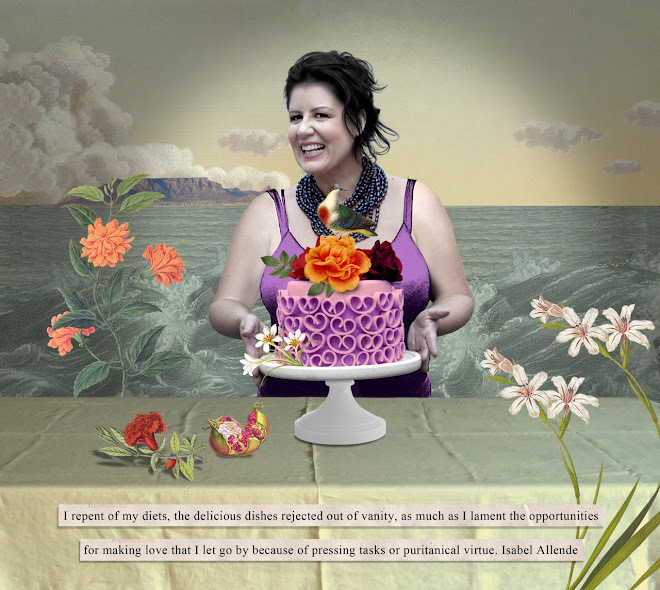 So there this book stood screaming at me from the middle shelf in Exclusive Books, 'How one woman's mission to lose weight became a journey of discovery.' And I bought it, along with some hot cross buns from Woolies. But what is significant is that I was meant to buy and read this book. So that I could tell my friend Nicky to go out and buy it immediately. Because this book is probably one of the most honest and meaningful accounts of immigration that I have read. Joanne Fedler and her family left Cape Town to make a new life for themselves in Australia, and this book is about her heartbreak of leaving South Africa, and the enormous sense of loss that she experiences. Also about how she adapts and makes peace with herself and her circumstances. In the emigration/immigration debate there are no right or wrong answers. But it is hard. For all concerned. By reading this book, I could understand what my friend is going through, and perhaps, by her reading it, she can feel less alone. It also made me think really hard about the sacrifices one makes when you have children. But this is more than just a book about hunger, or emigrating. It's about loss, about love, about making the best of a hard situation, about what it means to be born in a country, of how to make another country your home. It is about faith, and friendship and low schmaltz chicken soup. And reading it made me realise, that being hungry, is never, not only, about food. I used to love using my peppermint crisps as straws! Now I would use them to make my very decadent chocolate mousse. Hope your friend has a super NBA in Perth - it is a lovely city to live in. Tandy, Hmmm, Peppermint Crisp chocolate mousse sounds divine! And thanks for the message re Perth, I'll also pass it on to Nicky. Love peppermint crsip btw. A thing my (Dutch) husband can not fathom! And as another 'Nicky' - I am leaving Perth (after 2.5 years here) and heading back to CT. 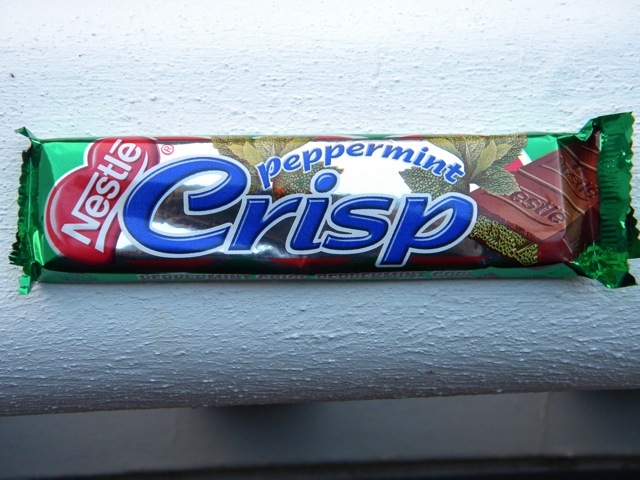 The lure of Peppermint Crisps and so much more has just been impossible to resist. To Another Nicky. We look forward to welcoming you home! Good luck with the goodbyes and may everything that lured you back, bring you untold joy.